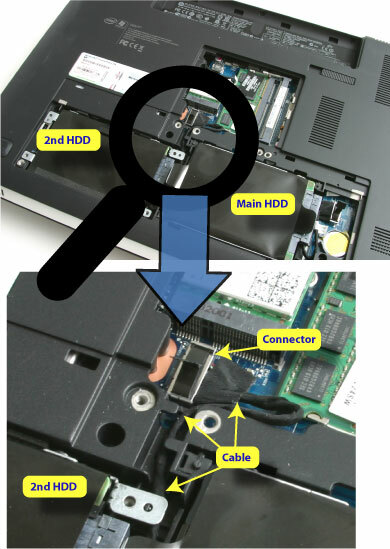 Instructions on how to install a 2nd HDD (or SSD) to a HP Pavilion dv7 / dv7t 4000 & 5000 Series Laptop. Before you begin power down the laptop, turn it over and remove battery. You will need a "2nd Drive Caddy Kit" to install a 2nd HDD (or SSD) in the 2nd drive bay of the dv7 laptop. The kit consists of a caddy/bracket, cable with connectors, drive screws and bracket screws. The drive caddies for the primary drive bay and the 2nd bay are not interchangeable. Assemble the HDD and 2nd HDD caddy with the 4 drive screws. Attach the cable (SATA connector) to the HDD (or SSD). The SATA connector will only go in one way. Note: you can use SATA 2.5" drives up to 12.5mm in height. Below is a close up view of how the cable/connectors are to be inserted into the drive bay. There is a small "pathway" that goes from the 2nd HDD bay to the motherboard connector. The cable goes under one of the corners of the caddy's metal rail/bracket and through the pathway as shown below. Once caddy and cable/connector are in place. Secure the caddy/bracket to the dv7 laptop with the 4 bracket screws as shown below. If you have installed a brand new HDD, you may have to format and partition the drive before it can be seen by your laptop.